UPDATE 6/1/2015. Sadly, Google has discontinued the Desktop Search tool. Microsoft dramatically improved the search function within Windows and Google's normal business model of displaying ads next to search results would creep people out when displayed next to results from a PC's disk drive. (Although DS never did that, there was no way to make money for Google in the future). While there are some other apps, Google's was the best. Where did you put that file? Or that email? Searching for documents on your PC can be a nightmare. So many documents. So many emails. Sometimes it's like searching for a needle in a haystack. But Google offers an elegant solution. 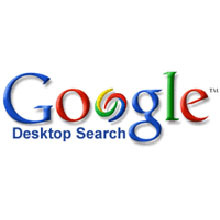 Their free program, Google Desktop, indexes your hard drive the way Google's own servers index the Web. Your search results are returned on a web page similar to when you do a real Google web search. After you download and install the software, Google Desktop gets to work indexing your hard drive. If you have a lot of files, this can take a while. Just sit back and relax. You'll be able to find those files in no time.